Panasonic top quality air conditioners have a cooling and heating option for just about every space, room or building in both residential and commercial applications. With choices across ducted, single split system, multi split, cassette, VRF and more you’re sure to find the perfect Panasonic air conditioning system for your needs. Control the temperature inside your home today with a new Panasonic air conditioning unit. Panasonic has won the Most Satisfied Customers Canstar Blue award 3 times so they must be onto a good thing. ‍Activity detection - adapts output to your daily needs. Sea Air can take care of the installation of all styles of Panasonic air cons throughout Brisbane and the Sunshine Coast. Our experienced team can also offer specialist advice on which size and style will suit your specific building and heating and cooling requirements. There are many aspects to be considered when choosing an air con. Air conditioning design is not a one-size-fits-all situation, things like insulation, windows, flooring, as well as individual room size, all need to be noted to ensure your system will comfortably cool and heat the space all year round. Keeping your air con in top condition only takes a little work. Regularly cleaning filters and addressing any issues as they arise ensures your reverse cycle air conditioner will keep your family or workplace cool in summer and warm in winter. Sea Air’s air conditioner technicians offer complete residential and commercial air conditioner repair and maintenance services. 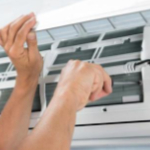 For the very best in Panasonic air conditioning installation, repairs and servicing throughout Brisbane and the Sunshine Coast contact Sea Air Mechanical Services on 0401 787 183 or complete our booking request form today. Sea Air offers great supply and installation deals on reverse cycle split Panasonic air conditioning systems.